After our assessment yesterday, I found time to play two rounds of disc golf on the 9-hole course at Chatauqua Park in Fairfield, Iowa. 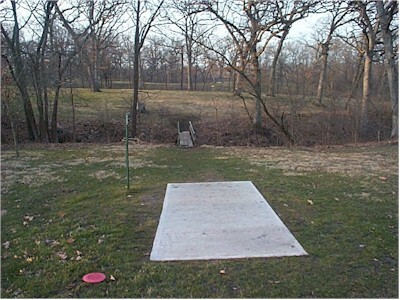 I played on disc against the other, so I actually got to play 36 holes. This is a nicely maintained park with grassy fairways and some rather unforgiving rough, consisting of deep gullies and trees. In my first round, I shot one over and three over par. Things went better in the second round, with a -2 and +1. This, as I recall, is hole #6; the pin is across the gully slightly to the right of the bridge.